On big alpine routes, where weight matters more than anywhere else, one might think that hexes and tricams are particularly desirable. However, I now believe that cams are superior in every instance because it is so much faster to make a solid placement and also to remove a solid placement. In addition, the newer generation of cams are more ergonomic and lighter than older varieties. Cams are especially advantageous over hexes when french-freeing in the interest of time because a cam can quickly be shoved in a crack to pull on and then immediately pulled out to use later on the pitch. Because the largest cams are the heaviest, they are the ones that should be considered most critically for inclusion on the rack. The rock type of the route might influence your decision whether or not to bring the big cams; when climbing on compact gneiss big cams are rarely necessary, but on monolithic granite sometimes a wide crack is the only feature between blank slabs. Avoid cams with woven-sheathed cables (Aliens) for alpine climbing, as they can freeze up and become useless, dead weight. 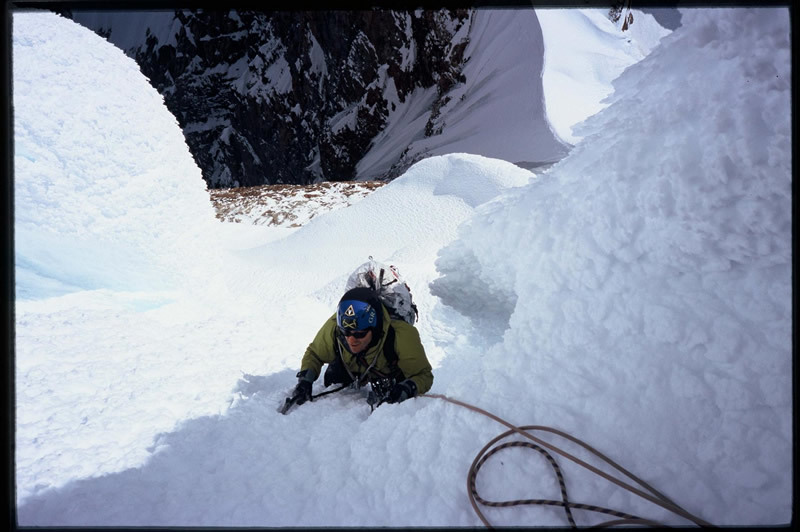 Mark Westman on Aguja Rafael, Patagonia. Photo by Colin Haley. Nuts and pins are much more important on an alpine route than at the crag, both because they provide many placements with little weight and because they will be your first choice of hardware to leave behind in the event of a retreat or unknown descent. A marginal nut placement can sometimes be made much more secure by ‘stopperheading’ it – using your ice tool to set the nut deeper into the crack. The most important pins to bring are usually knifeblades because they will provide protection in situations when you can’t find anything else. The heaviest sizes of pitons are the Lost Arrow pins, between knifeblades and baby angles. Z-pitons are a good weight-saving alternative to Lost Arrows. Also, titanium pitons are a good way to save weight if you can procure any. Screws are obviously an important component of the rack for most big alpine routes. It is always a good idea to bring one long (19-22cm) screw for making v-threads, but consider bringing mostly just 13cm screws for the rest of the rack. In good ice a short screw is just as strong as a long screw, and in bad ice they’re probably both worthless! A short screw is more versatile because it can be placed in thin ice, and is also lighter than a long screw. The coffee grinder handles on express ice screws add very little weight and are worthwhile for the increased speed and efficiency. Titanium screws are not worthwhile, requiring immensely more force to place than steel screws because they are not engineered/tooled with as much precision as steel screws. 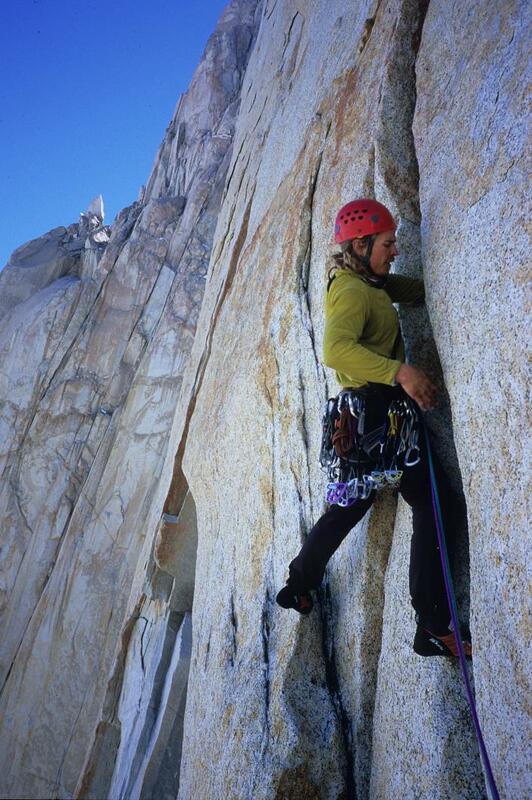 Terrain where pickets are useful – Kelly Cordes on the West Face of Cerro Torre. Photo by Colin Haley. Slings and biners are the items on a modern rack with perhaps the greatest weight savings over their earlier predecessors. Use only wire-gate biners for everything but your lockers – wire-gate biners are lighter, safer, and will never freeze up. With several new wire-gate biners below 30 grams, the potential weight savings over old biners are substantial. The new generation of dyneema slings, with widths of only 7-10mm, are also amazingly light, even compared to the slings of just 6 years ago.These super-skinny slings are full strength but not especially durable. Consider keeping a rack of super-skinny slings for alpine climbs that matter, and using standard spectra slings for the crag and less important routes. Daisy chains are for aid climbing, and do not belong on your harness unless you expect substantial sections of exactly that. It is much faster, safer, and easier to adjust, if you clip to the anchor with a clove hitch on the rope(s). The one situation when daisy chains are convenient is when rappeling, but at those times you can clip to the anchor using some of the many sewn slings that are on the rack anyways. Pickets are heavy and cumbersome to carry on a route, so consider carefully if you really need them. If you have a lot of experience alpine climbing you might feel comfortable running it out or soloing on 50-degree snow and nevé slopes. The situations when pickets are useful are when the climbing is hard but consists only of snow: corniced ridges in Alaska, Peruvian flutings, Patagonian rime mushrooms, etc. Both climbers should absolutely use a belay device that is auto-locking for belaying the follower. Belaying straight off the anchor in this fashion is safer, and gives you time to eat, drink, and adjust clothing at a belay. Make sure that the belay device you bring gives adequate friction for the diameter of your ropes – the standard-size Petzl Reverso is not adequate for rappeling on most alpine ropes.